In Italy today we are celebrating the 150th anniversary of the Italian Unification (1861 - 2011), and all I could do was post pizza, the symbol of Italian culinary art. Pizza is an healthy and complete food, it is made with simple ingredients: flour, oil, salt and yeast. They recently tried to take its patent away from us but they did not succeed because the truth is that pizza has been a made in Italy product since its ancient origins. Some experts assume that it was already listed in Etrurian's cuisine, with different ingredients and forms obviously. Pizza that is known today is the one that derives from the bun which was very common in Roman times. In those days, it was customary to cook farro buns, a typical wheat widely used by the Romans, in fact, it is believed that the word flour comes from farro, while the word pizza comes from "pinsa", which is the past participle of the verb "pinsère" which means "to mash", "to grind", "to crush". In some of Virgil (the poet who wrote "Eneide") works, is told the story of some farmers who used to grind wheat grains, sift the obtained flour, mix it with aromatic herbs and salt, crush to make it thinner, make a round shape and then bake it in the hearth's ashes heat. After the Roman Emperor downfall, there is no specific news about the making of pizza development. The second was imported from Peru, after the discovery of America, and was at first used as a sauce cooked with a little salt and basil leaves then, later someone got the idea to put it on the pizza. Prepare the dough: Take a large mixing bowl and put in it half of the flour. Heat and divide the water in two different containers and dissolve in one the sugar and the yeast, and in the other the salt. Pour the water with the yeast and the sugar in the mixing bowl with the flour and knead until it will become firm and put to one side. Put the other half of the flour into a mixing bowl and add the water with the salt, knead until it becomes firm too (picture 1). Put the two mixtures in a mixing bowl, add the olive oil (picture 2) and knead them well until the mixture is smooth, velvety and evenly damp (picture 3). Always avoid to keep the salt close to the yeast because the former prevents the latter to perform its function. Cut the dough into balls of the desired size, according to the thickness of pizza that you want to get after cooking. Place them on a baking sheet at a distance (picture 4) to allow their volume to double (picture 5), let leaven in a dry place away from draughts and at a constant temperature, about 25° C (75° F). After leavening time, take one ball of dough and roll it out in an oiled baking tray by pressing with the fingers to obtain a homogenous layer that reaches the sides of the container (picture 6). Spread the pureed tomatoes, add salt, a drizzle of olive oil (picture 7) and let it rest for half an hour before cooking. 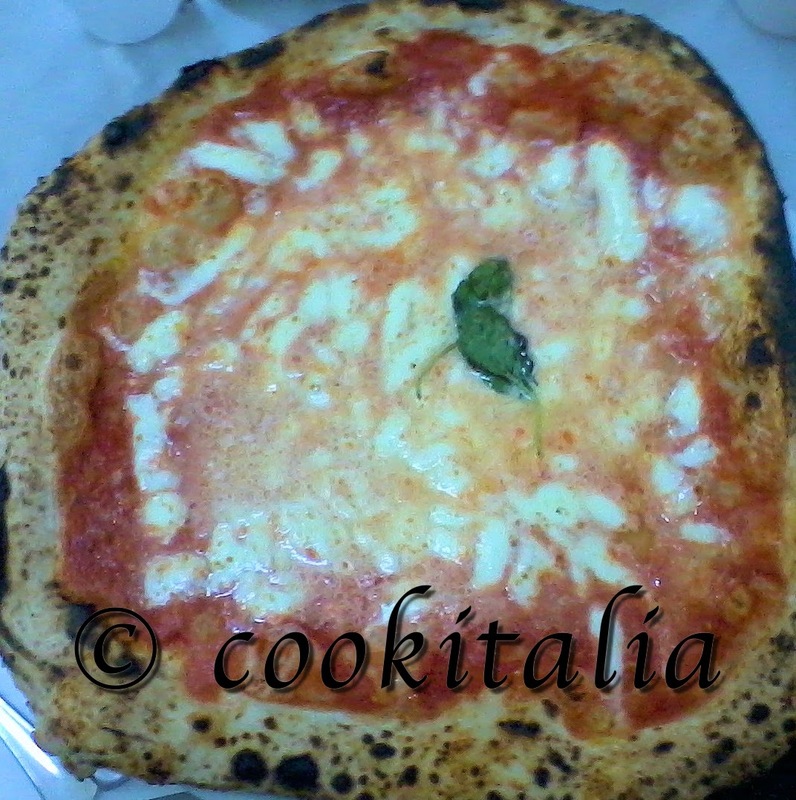 Preheat the oven to a temperature of 250° C (480° F) before baking the pizza. (I recommend you to put in the oven a pan with water to keep it moist and prevent the dough from becoming too dry.) Cooking must be done in two different times: first just cook the pasta with tomatoes puree, salt and olive oil and then, when its almost cooked, add the mozzarella and basil leaves (picture 8 - 9).